DUBAI (Reuters) - Iran's supreme leader on Sunday called on state bodies to support the government of President Hassan Rouhani in fighting looming U.S. economic sanctions, saying America's "conspiracy" could be defeated, according to his official website. Ayatollah Ali Khamenei used a speech to members of Rouhani's cabinet to call for support for the government and action against alleged financial crime to ease popular concerns fueled by U.S. President Donald Trump's decision to withdraw from world powers' 2015 deal with Iran on its nuclear program. The likely return of U.S. economic sanctions has triggered a rapid fall of Iran's currency and protests by bazaar traders usually loyal to the Islamist rulers, and a public outcry over alleged price gouging and profiteering. 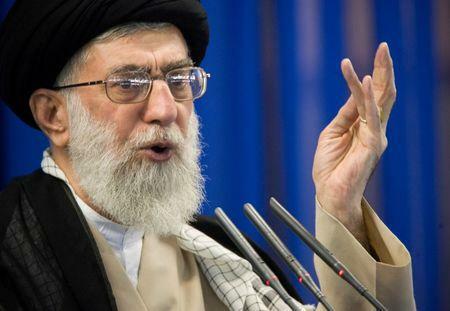 Khamenei said "the government's economic team is the axis of all activity in the country, calling all the bodies to coordinate with it," the website reported. "(He) advised state radio and TV to reflect a correct image of government activities." "I strongly believe that if the government takes the necessary measures, it will be able to overcome problems and defeat the U.S. conspiracy," Ayatollah Ali Khamenei said in a meeting with Rouhani and his cabinet, according to his website. Khamenei called for strengthening the private sector while taking "decisive action" against economic crime such as money-laundering and smuggling of goods, blamed on those profiteering from the economic crisis in the country.